71 Degrees In February: Temperatures In Boston And Buffalo Rewrite Record Book : The Two-Way An all-time high temperature for February was recorded in Boston. After breaking a 111-year-old mark for this day, Buffalo, N.Y., also equaled its record high for the month. Shortly after 1 p.m. Friday, the temperature in Buffalo, N.Y., hit 71 degrees, according to the National Weather Service, in the latest sign of the mild, even warm, winter that much of the Eastern U.S. is experiencing. 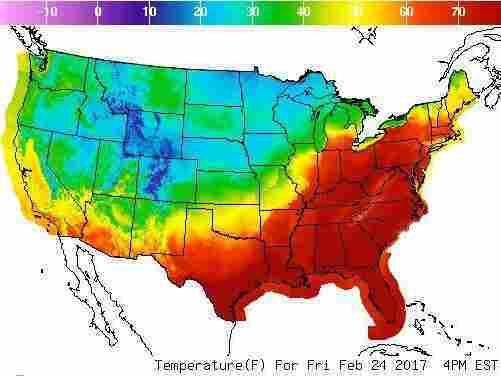 "That surpasses the 70 degrees reached on Feb. 24, 1985" in Boston, member station WBUR reports. "Records go back to 1872, according to the National Weather Service." In Buffalo, 70-degree temperatures broke the Feb. 24 record shortly before 1 p.m., according to the NWS office at Buffalo International Airport. It then rose further to 71, equaling a mark set in 2000. Buffalo's record of 67 degrees on Feb. 24 had stood for 111 years, according to the Buffalo News. To put that 1906 date in perspective, Theodore Roosevelt was president. At the time, local news included an inquiry into reports of fish being dynamited in the Niagara River, the newspaper says. On a broader level, on Feb. 24, 1906, the author Upton Sinclair was just days away from publishing his seminal novel, The Jungle. By the end of next week, Buffalo (and other areas) could be facing a return to winter. The National Weather Service predicts a chance of snow on Thursday, with a high near 34 degrees.